Whether you are an amateur bodybuilder, professional athlete, or weekend warrior you want to perform better than you do currently. Diet, training, recovery, and sleep can go along way to optimizing performance, but what if you wanted to maximize it? Performax Labs has created the ultimate performance-enhancing stack using all-natural ingredients to help you run fast, hit harder, and jump higher. Let’s be clear from the start. It’s entirely possible to have a killer workout without the use of any supplements whatsoever. However...when there are an abundance of phenomenally dosed pre workouts available, why not use everything at your disposal to help you perform at your absolute max?! This includes pre workouts -- a dietary supplement originally developed to enhance your performance. And Performax has created one of the best high-stim pre workouts for enhancing performance in HyperMax. HyperMax delivers 325mg pure caffeine anhydrous alongside a synergistic matrix of research-backed ingredients that increase blood flow, boost adrenaline, heighten focus, and most important boost performance. VasoMax is the non-stim counterpart to HyperMax that enhances VO2 max, endurance, hyper hydration, and sustains focus thanks to a powerful lineup of ingredients inlcuding VASO6, GlycerPump, GSNO, and Alpha-GPC. As you probably guessed, VasoMax has been methodically engineered to maximize vasodilation, which supports greater blood flow along with increased nutrient and oxygen delivery to working muscles. This supports greater ATP production and power during training along with some serious pumps! Muscles are made of protein, and protein is composed of amino acids. Of all the amino acids used by our bodies, the most important ones are the essential amino acids (EAAs). These are nine amino acids that you MUST obtain from food as your body can’t make them on its own. EAminoMax supplies all nine EAAs to support muscle recovery, repair and growth, but that’s not all. 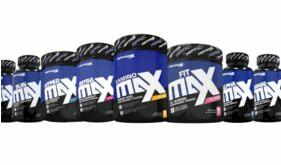 Each serving of EAmino Max also supplies L-Carnitine L-Tartrate to improve blood flow along with HICA to reduce the breakdown of newly gained lean mass. To complete this top-notch intra workout, Performax Labs also includes an electrolyte blend to support muscle function and replace those lost during grueling workouts. Simply put, if there was only one supplement everyone should use (athlete or not), it’s creatine. The research supporting creatine as an effective strength and muscle builder is indisputable. CreMax is your daily creatine supplement providing your muscles with 5 grams of creatine from a trio of potent creatines in creatine monohydrate, creatine anhydrous, and magnesium creatine chelate (MCC). Combining these different forms of creatine creates synergistic benefits by increasing overall transport and effectiveness of creatine.